“We felt there was a place in the market for a very high performance yet practical product at a very affordable price it, we felt the concept of Audiolab was workable – affordable high end. We thought we could bring useful functionality, true high end sound and excellent reliability”, Philip Swift remembers. A physics graduate of Cambridge University, he was one of a generation of gifted hi-fi entrepreneurs, such as Meridian’s Bob Stuart and Arcam’s John Dawson, who’d excelled academically and arrived in the jobs market just as the hi-fi boom was starting. Swift’s partner Scotland was a mechanical engineer, and between them they came up with one the most mature new products the hi-fi market had ever seen. The 8000A was launched in October 1983, and it was almost as if it was a ‘mark 2’, so devoid was it of bugs and rough edges. Everything from the fascia design to the circuitry was elegant, all well thought through and often quite different to the rest. “It was lavish relative to those British minimalist products, but ours still had nothing superfluous”, Swift says. Indeed, its many features were just what was needed by many audiophiles of the day, without descending into gimmickry. For example, the tone controls worked over specific bands, 100Hz and 10kHz, and had modest boost and cut. They functioned more like tilt controls, and were positioned horizontally to show the frequencies. The amplifier delivered a very healthy (for the day) 50W RMS per channel into 8 ohms. This didn’t change on paper says Swift, “but the power output increased over the years; it was capable of virtually doubling it into 4 ohms and could drive a 2 ohm load”. Inside, the topology of the amp was very original, from input to output; the mechanics, physical layout and heatsinking were all like nothing else on the market. “We created a differential preamplifier circuit topology which gave a very linear, low distortion, very quiet design. The wide bandwidth power amplifier ran with low feedback, and special resistors and capacitors (not ceramic capacitors) were employed to give the sound we wanted”, he remembers. The Audiolab 8000A first appeared in a dark gunmetal grey colour, made from sturdy sheet steel. Its fascia was distinct for two reasons; first the source and record selectors were very unusual back in the day, and second it was – Philip Swift claims – the first ever amplifier to have a dedicated CD input; not just the word ‘CD’ written where once was ‘AUX’! It was level matched to CD players’ (then) non-standard above-line-level voltage, and this sat alongside several other inputs too – including a switchable MM/MC phono input. The plastic knobs looked cool, worked smoothly and the 8000 had a general air of precision about it that just wasn’t possible from some of its ‘cottage industry’ competition. 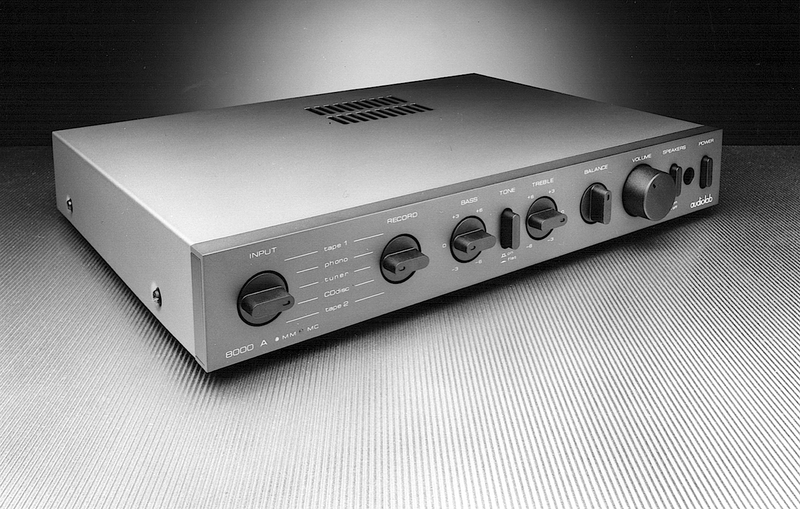 Around the back, there was a plethora of RCA phono inputs – again some Brit rivals like Naim and Myst were using DINs – and a switchable MM/MC phono input. Usefully the phono input section had a set of RCA phono sockets for each, so you could effectively plug two turntables into it and switch between them – very handy for some! Decent speaker binding posts offered a choice of bare wire or banana plugs, unlike the strange arrangements that some rivals featured. The preamp and power amplifier sections were separable, giving a wonderfully simple upgrade path, too. All in all, it was almost impossible to criticise the 8000’s connectivity and facilities; they were light years ahead of many rivals, and yet it was all laid out in a wonderfully simple way. By the standards of the day, the Audiolab was a veritable powerhouse of a thing, able to drive pretty much any speakers on the market. It had a clean, open sound with plenty of detail and no nasties – although the early ones were a little cerebral. The company didn’t rest on its laurels though, and over the course of its thirteen year lifespan had seven major revisions – roughly one every 24 months. The power amp was tweaked to sound cleaner and deliver more current, and a lot of mods were designed to bring reliability improvements – ironic considering it was one of the most reliable British amplifiers of its time, from the word ‘go’. By the end of the production run, 255 of the 256 components in the amplifier had been upgraded – the only remaining one being the original round red push button on the back panel, used to switch between MM and MC. By the early nineties, the 8000A was a truly fine sounding amplifier, with a big, expansive and enjoyable sound – albeit not quite as visceral and ‘edge of the seat’ as rivals from Naim, for example. Still, it won many thousands of friends, and must be one of the best selling amplifiers of the eighties and nineties. Because there are so many around, finding a secondhand Audiolab 8000A is easy. The late-period ninetten nineties ones are the ones to go for, but all are reliable to a degree that many rivals from this period can only dream of. The RCA phono inputs can crack on the printed circuitboard with extended use, so it’s worth checking any amp works on both channels across all its inputs. It’s also a good idea to replace capacitors which may be past their best by now. The finest sounding amplifiers were the latest ones, just before Audiolab ‘became’ TAG McLaren Hi-Fi, so a well preserved late nineteen nineties amp is the best bet, although anything from the late eighties will be a pleasing listen. Expect to pay between £50 and £200 depending on condition and age. how does one connect a new Panasonic TV to an old Audiolab 8000a so that the TV sounds goes through the amp?…Dow anyone have any ideas??? ?